Aspyr Media has announced the release of Call of Duty Deluxe Edition, a $30 download available through its GameAgent online download service. Relive the gritty hell of World War II in Call of Duty. Call of Duty Deluxe Edition combines the original Call of Duty with its expansion pack, called United Offensive. Call of Duty is an award-winning first-person shooter that puts you in the front lines during World War II, in the European theater of operations. 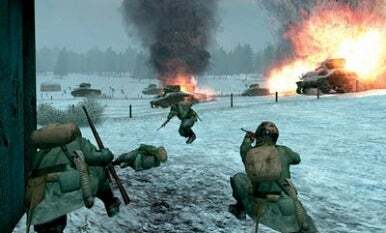 Call of Duty lets you play through 24 single-player missions in four interconnected campaigns: playing through D-Day, the Russian charge at Stalingrad and the Battle for Berlin. You can also play online against other players, taking the sides of either the Axis or Allies. United Offensive adds 13 new single-player missions, 11 new multiplayer maps and three new modes. When it was originally released for the Mac, Call of Duty was available only for PowerPC-based Macs, and it was only available for purchase on disc. This download release marks the first time the game has been developed to run natively on Intel-based Macs. Aspyr said it’s working on a Universal binary patch for the retail version of Call of Duty Deluxe as well. Call of Duty Deluxe Edition is rated T for Teen by the ESRB. System requirements call for Mac OS X 10.4.11 or Mac OS X 10.5.7, G5 or Intel 1.6GHz or faster, 256MB RAM, 2.5GB hard disk space, ATI Radeon 9800 or Nvidia GeForce 5200 or better 3D graphics (Intel integrated video chipsets not supported).